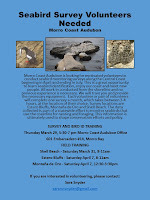 Morro Coast Audubon is looking for motivated volunteers to conduct seabird monitoring surveys along the Central Coast, beginning in April and ending in July. All work is conducted from the shoreline and no previous experience is necessary. We will train you and provide the necessary equipment. Each volunteer or pair of volunteers will be responsible for completing one survey a month, which takes between 3-4 hours, at the location of their choice. 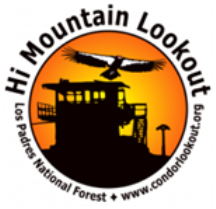 Surveys locations are Estero Bluffs, Montaña de Oro, and Shell Beach. The data collected is part of a statewide effort to monitor seabirds that use the coastline for nesting and foraging. The data is ultimately used to shape conservation efforts and policy. To learn more, attend our Introductory Meeting on Thursday, March 29th, 5:30-7:00 PM, at the Morro Coast Audubon Office (801 Embarcadero #14, Morro Bay, CA).